The other night I got together with friends who were back in town for the holidays. One of them is living in NYC and needed earrings to wear with a gorgeous deep red strapless Amsale gown in a wedding this weekend. 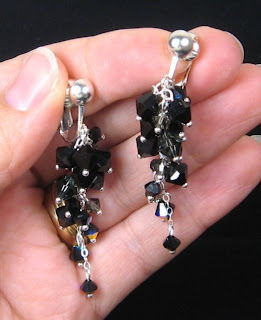 She wanted me to make dangly clips with black Swarovski crystals, and when asked why she still doesn’t have her ears pierced she said it keeps her from buying too many earrings. Anyway, these are what I call a cluster style, and the crystals are jet, jet with aurora borealis coating, and morion (dark gray). Anneliese put them on immediately and couldn’t keep her head still because – let’s face it – dangly earrings are fun to wear!